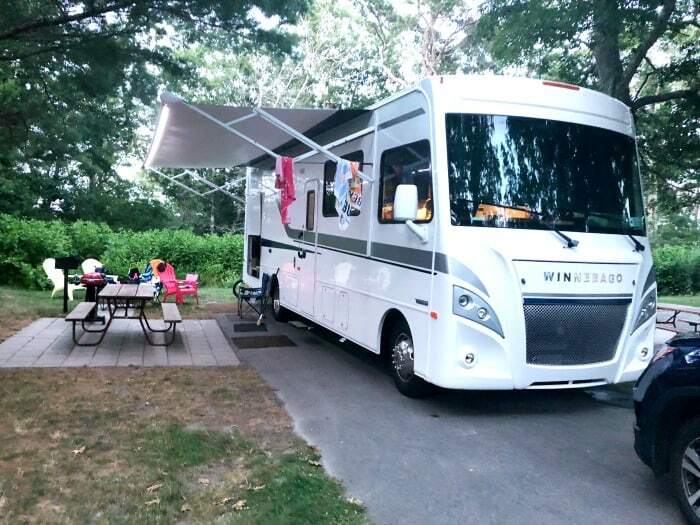 This RV camping post is brought to you in partnership with GoRVing and Winnebago. We have loved doing more and more travel as our kids have gotten older and we’re becoming more confident travelers. 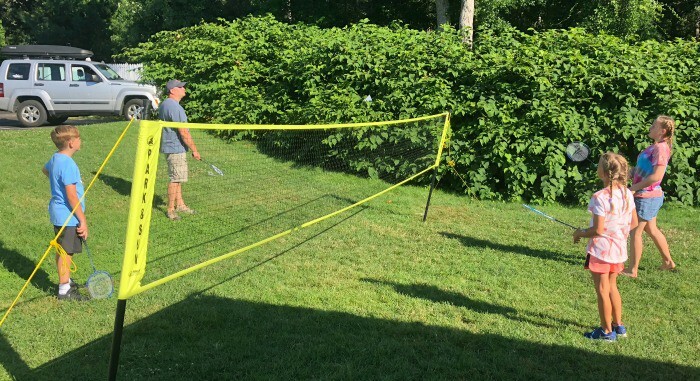 We weren’t sure what we wanted to do this summer in terms of a vacation, and we’ve had some discussion amongst the ranks that camping would be fun. Now, I am ok to camp, as long as I have a bed, and a shower. Sleeping on the ground is not my favorite thing to do but my dear friend Stacey and her family have a seasonal site at a campground that they have spent several summers enjoying and it occurred to me that perhaps I’m more of an RV camping girl. 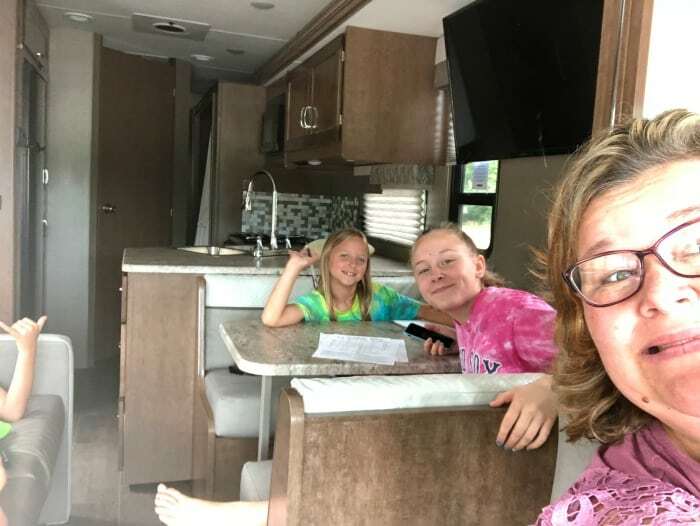 Thus, an idea to camp and be together as a family on a trip but also having amentities was born, and we reached out to the folks at GoRVing.com. 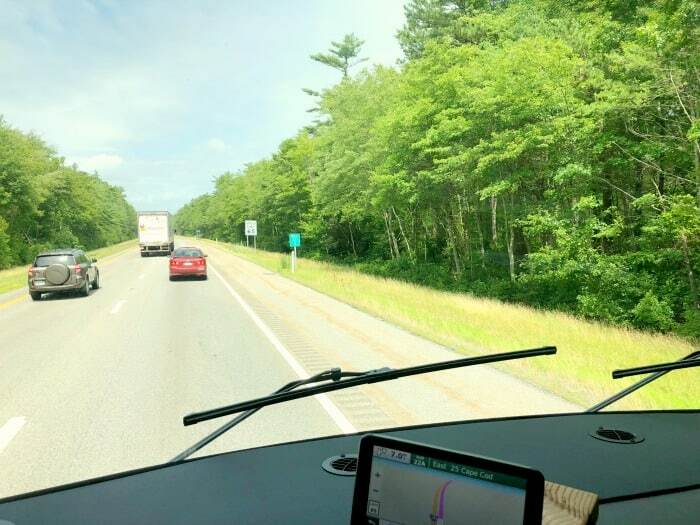 Fast forward to this summer, when we headed out on the open road (ok, more like the highways from Connecticut to the Cape) and embarked on a brand new Martin adventure! We love traveling as a family-sometimes, the greatest memories are made in the going to or from a destination, you know? So having the journey to and from the destination be part of the whole experience was pretty cool. Having what I can only describe as a house on wheels was amazing. Now, I haven’t ever driven an RV prior to this trip. Not even once. I’m pretty proud to tell you I did it! I’m totally serious. We forgot to put my husband on the paperwork so I was the lone RV driver for both trips. My first practice run? Picking up the oldest at gymnastics practice 20 minutes away. It was a little scary as I pulled away from the curb, then exhilarating, and then really just fun. I can tell you if they had cameras on the side mirrors to help gauge where exactly you are between the lines on the road, I would be happy, but I think overall I did a pretty good job of staying between them without. For peace of mind, especially when traveling on a multi lane highway or something, those would be a nice little extra feature to have. 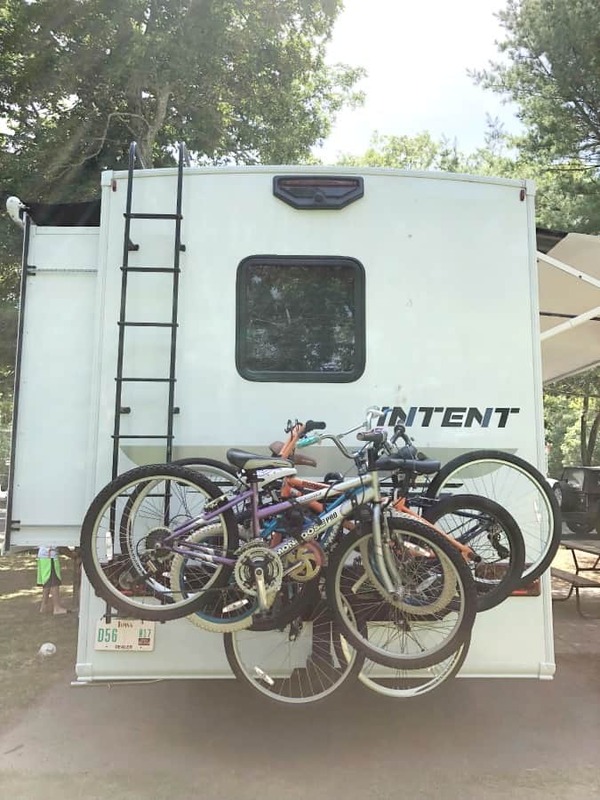 The Intent has just about everything a family traveling together could want or need. We packed numerous board games (find out which board games we think are great to bring for a family camping trip! ), card games, activities, crafts, movies, and more and still couldn’t fill more than half of the storage RV-wide. 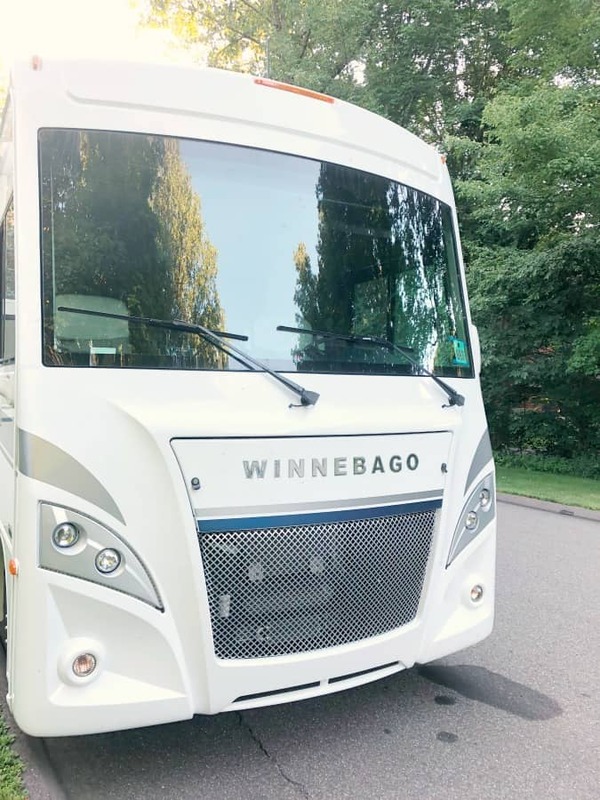 Winnebago certainly has mastered the art of maximizing every inch of space in their vehicles. 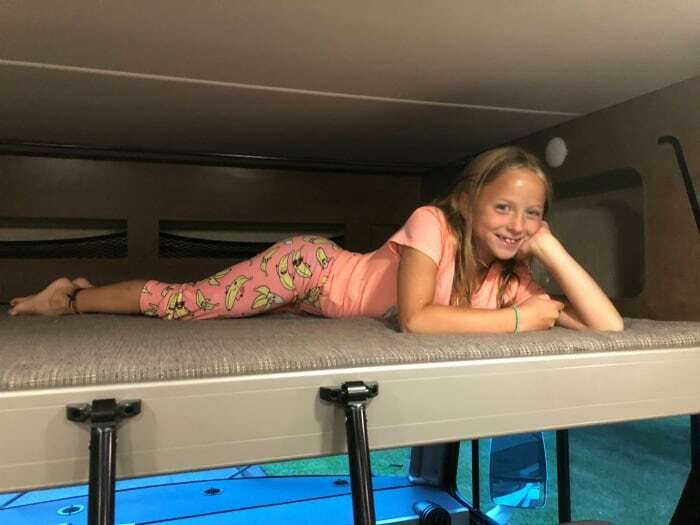 The RV we were in can sleep 7 comfortably- 2 in the master, 2 in the bunks, 1 in the loft bed above the captains chairs, plus a smaller child at the banquette and the couch when those are turned into a bed. The whole back of the vehicle is a master bedroom with numerous drawers and closets. A nice sized tv sits in a cabinet tucked against the wall, and there’s even some “secret” storage space behind that. Little lights are built in all over the cabinetry to help see what you’ve tucked away in different places. We put all of the clothes and linens for our family of 5 in the master bedroom storage and still had empty cabinetry. A nice touch for charging, plugging in a reading lamp, etc., is a little cutout in the side of cabinets on either side of the bed by the pillows with an electrical outlet. A cute little bedside nook. I kept some water, charged my phone and had my beach reading tucked in there for nights I might not be ready to sleep right away. We even had sliding doors for privacy! One door went into the bathroom, the other into the hallway that opened up when we were all set up with the slide out. The bathroom was surprisingly bigger than we’d anticipated seeing in an RV. A skylight above the shower made it nice and bright and gave things an airy feel. 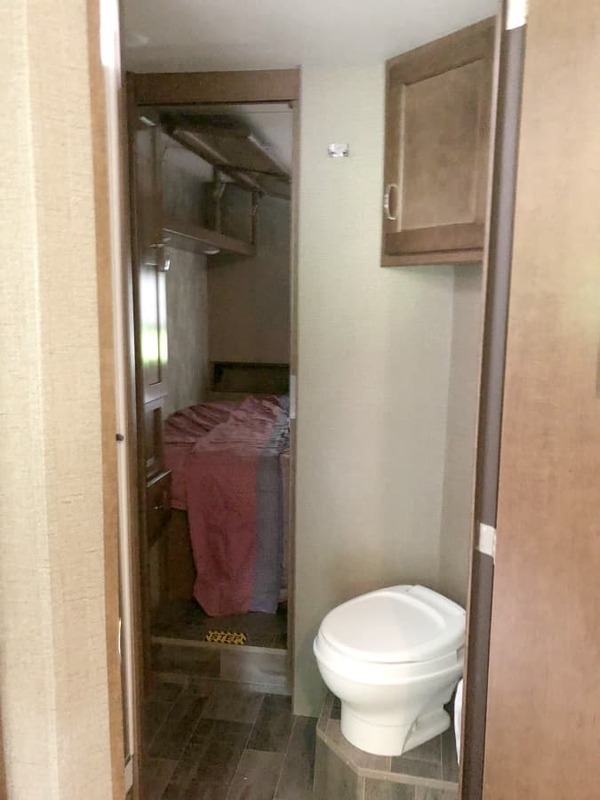 Even in a small RV bathroom, we had storage below the sink and above the toilet. Note: try to purchase your toilet tissue before heading out on the road. It’s not always easy to find- or it may be sold out when you arrive at your campground. You can’t have too much TP, right? Also? The shower had hot and cold water. Hot water while camping. In a private shower. It was amazing and wonderful and I have found a new love for camping because of it. The Intent has two bunk beds with privacy curtains that worked great for our 9 and 11 year olds. 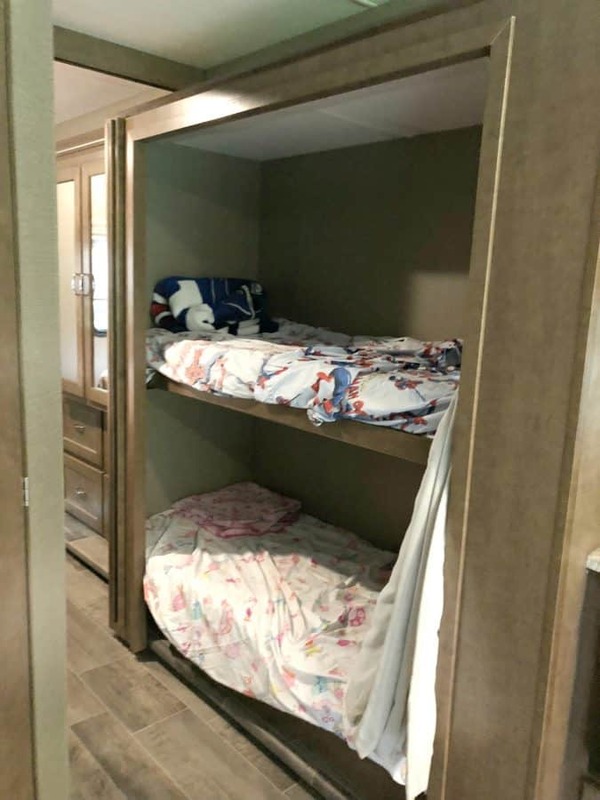 The bunks share a privacy curtain, which the kids LOVED- they thought it felt like they were sleeping in a fort all week and it was also nice for privacy when changing into a swimsuit or pajamas. Each bunk had a light plus an outlet for charging or powering a reading light as well. The way the bunks are built in, the ends kind of wrap around each mattress enough that pillows and stuffed friends are kind of kept in place and weren’t falling onto the floor in the middle of the night. 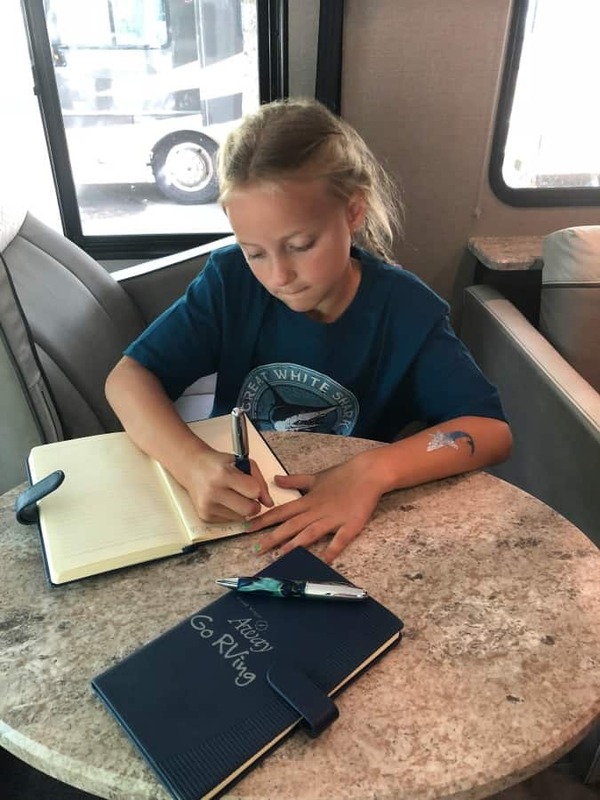 She decided to start a log book of all of our adventures, and leave it for others to add to. Would be fun to see it again one day! The kitchen had everything we could want. Lots of counter space, storage, a stove, oven, microwave, and pretty large refrigerator made us really happy- we had a set number of days in our trip, and we were able to sit down and plan to do our breakfasts in the Winnebago, lunches to pack for heading out on adventures, and also planning to do a few dinners out. This saved us I don’t even know how much money, but still allowed us to enjoy fresh local seafoods, etc. While eating at a restaurant can be fun, it can get old fast, and it’s not always easy to find something that will please everyone, or meet dietary needs/restrictions. Having the space and tools to be able to cook meals just like at home is a huge money saver, and meant that we could maybe splurge to do something else we’d not normally do. 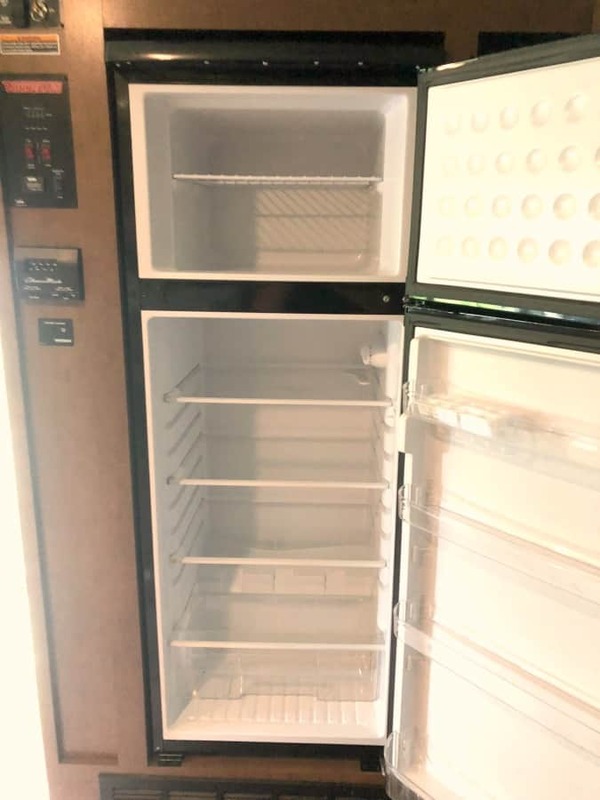 Just having a refrigerator to keep water cold and have a lot of fresh fruits and veggies available for snacking was a treat for vacation! 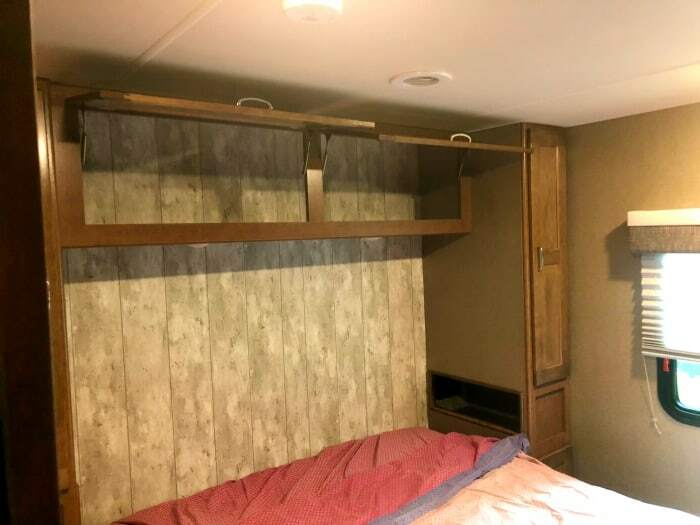 The main living space of the RV is cozy, but not cramped. When the side is out, there’s a nice little kind of “hall” between the couch and banquette, leading to the captain’s chairs in front. The passeneger seat when spun around offers our family’s favorite view of the television that sits abouve the table. We enjoyed watching some movies at the end of a long day of beach going, adventures, bike riding, etc. a few nights of our stay. The table offered ample room for some serious board game time after dinner and on a rainy afternoon…although there was one day I had a headache and was able to just sneak away to the master and have a movie on quiet volume while the rest of the family was playing in the living area. My husband and 9 year old absolutely loved the outdoor entertainment/kitchen area. 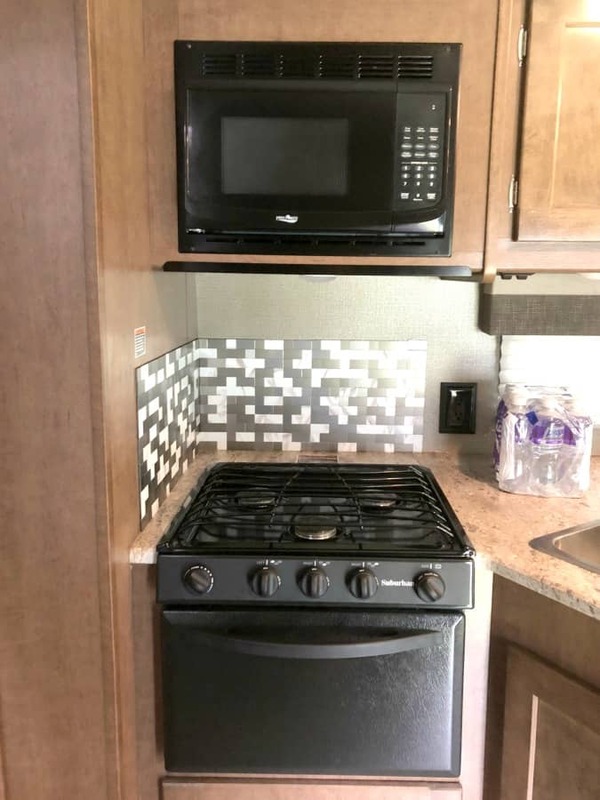 A mini fridge, counter, sink and a third tv are all tucked away at the back of the Intent. Watching Shark Week while being at the ocean was actually a lot of fun and I’m happy to report our only shark sightings were on the television, and not in the water we were swimming in. 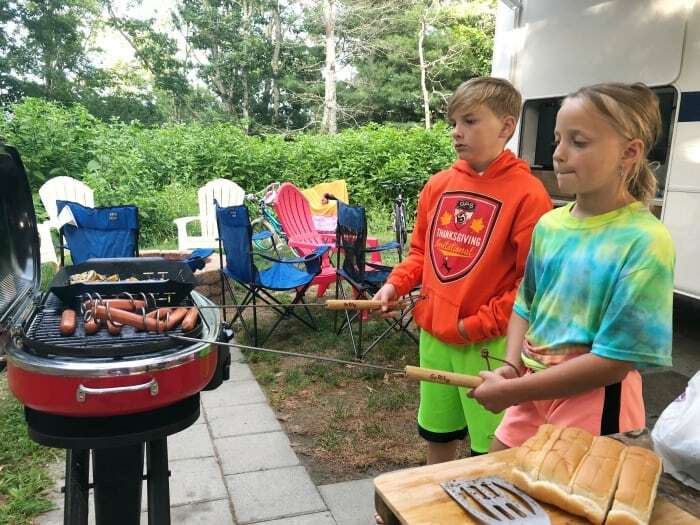 We had a propane grill on board our unit and we enjoyed cooking some of our meals outside and viewed it as a whole extra living space- even a light rain didn’t send us inside, as the awning rolls out and covered the outdoor kitchen area. We did a video tour of the Intent 31P for you. I think my daughter’s comment speaks volumes about the benefits of RV camping. Family time. Lots and lots of family time. Togetherness. I’ve got the camping bug now, and can’t wait to try again next summer and see where the open road takes us! We’ll pack ourselves up, load the bikes on the back and head for parts unknown! Visit our friends at GoRVing.com to learn more about the RVing life, how to choose one, where to take one, and so much more! Happy Travels! Wow! That RV looks very nice and spacious! 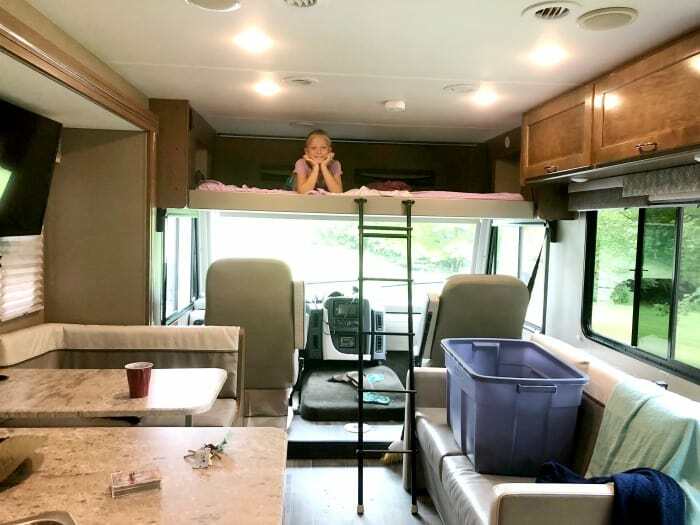 (My husband and I just finished a four-month-long road trip in our 37′ travel trailer.) Good for you for driving the whole way! Wow four months! That sounds fun! How fun! I want to go camping in a Winnebago too. It looks so nice inside and you’ve got to love those bunk beds. Soon, I hope. This brings back memories of my childhood and riding with my grandparents. My kids want to get an RV so bad. We have a tow behind camper, but I’d love to take a trip with an RV. Having everything all in one place where you don’t have to worry about unhitching and rehitching when you start and stop. This RV is so amazing! It’s always been a dream of mine to have one so that I can travel with my family. One day I’ll get there. Awesome post! I’ve always wanted to try RVing. We are tent campers but the idea of having a full home on wheels without the hassle of setting up and taking down would be so great! Look at that thing! I would go anywhere and everywhere in that thing! Oh my goodness, I want one! I just think it would be so fun to go touring around the country in something like that, and that one looks like it fits everyone more comfortably than my actual house! How wonderful! I have a big family so road trips were the best choice for family vacations. There were a few times we rented an RV, and oh my gosh it was fun. Yours is seriously the coolest with all of it’s great features. Hope to take my family on an RV trip soon. Oh my, you are amazing! I would love to have an adventure like this. It sounds fun and exciting! Wow, that is such a cool RV! It is so modern and has so many features. I would love to be able to travel like that, and I know my kids would absolutely love it. Believe it or not, I’ve never been RV camping, but it sounds right up my alley! I like to be out in nature but am not a fan of sleeping on the hard ground in a tent and going without a bathroom. Looks like you had a great time! Nothing beats RVing! It’s so much fun to be able to travel IN a home. Wherever you go, you’re already all set up to relax.